The Boulder City baseball team may be young this season, but that doesn’t mean there isn’t fight within them. The Eagles, at times, could start four sophomores and one freshman; what they may lack in experience they will make up for with determination. “Success has come to those willing and capable of paying the price,” is one of second-year coach Bobby Reese’s favorite quotes. That said, Reese and his assistant coaches are prepared for another successful season. There are four returning starters. Senior Mario Castanon, who started last year in right field, has moved to center field. Senior Colton Bosnos, who was the designated hitter last season, is taking over the catching duties. Sophomore Peyton Koopman, who started last season in left field, returns there and will be the team’s anchor in the outfield. Sophomore Austin Wishard, who was brought up late last year and helped solidify the infield during the playoff run, has assumed the responsibility of shortstop. The team could be helped in April when senior Taylor Wold, who played some outfield last year, returns from an injury. Koopman was 2-for-3 with a double and three RBIs, and Preston Van Diest was 3-for-4 with a run and two RBIs as the Eagles defeated visiting Pahrump Valley 12-2 March 18. The Eagles extended their unbeaten streak to five games (three wins, two ties). Will Knudsen was 3-for-4 with a double and two RBIs, and Bosnos went 3-for-4 with three runs and an RBI. The Eagles scored six runs in the bottom of the fifth inning to end the game by the 10-run rule. The Eagles fell to 3-2-2 with their 10-4 loss March 20 at Faith Lutheran. They also played Tuesday at Virgin Valley and Wednesday at Las Vegas. Their next home game is at 6 p.m. Friday at home against Eldorado. Last season the Eagles were 12-0 in the Sunrise League and were Division I-A Southern Region runner-up and state runner-up to Faith Lutheran. New to the varsity team will be juniors Nick Giunta, who pitched a couple of innings for the Eagles in the state tournament, and Austin Shepard, who is going to take over third base. Knudsen is playing first base, while Patrick Garvin and Seth Kermode will play in the outfield. Sophomores Nolan Desantis (second base), Zach Murphy (outfield) and freshman Van Diest (utility) will be vital to the team’s overall success, Reese said, adding that Van Diest could play all four infield positions as well as catcher and pitcher. 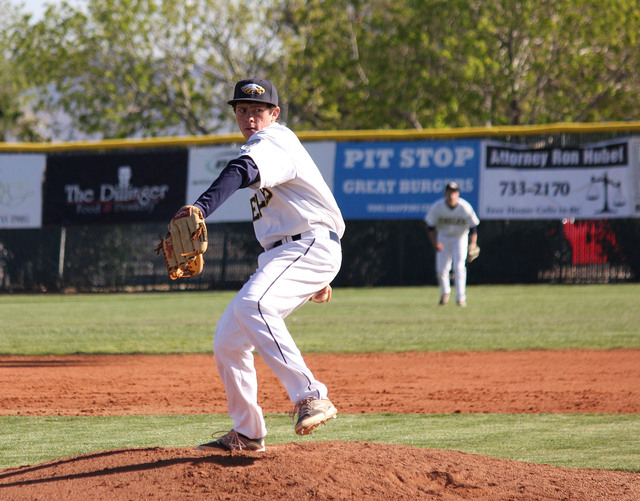 The Eagles will have a lot of options on the mound as 10 of the 14 players on the roster have pitching experience. “As a coach it will be fun to watch these kids develop into a very deep and talented pitching staff. It should also be fun to see who takes over that ace-of-the-staff role,” Reese said.